Peter Bywaters, singer of legendary Punk Rock icons ‘Peter and The Test Tube Babies’ was refused entry and then subsequently interrogated on Friday 28th of July at San Francisco airport. Instead of playing the following day at the Punk Invasion Festival in Santa Ana, Orange County, Bywaters was put on a plane back to London. During the course of his 6 hour interrogation at the hands of CBP ( Customs and Border Protection) officers, he was confronted with photos and videos of himself dressed as President Donald Trump from his last German Tour, PRESIDENTIAL TOUR 2016, where Bywaters was particularly scathing about Trump and US-Politics in general. Back in London Bywaters got his phone and passport back. Peter And The Test Tube Babies played the festival with the help of guest vocalists; Joey – Narcoleptic Youth, Ron – Lower Class Brats, Gabe – Oi Scouts and Mike – Blank 77. Peter and The Test Tube Babies new album ‘That Shallot’ will be released on September 15th via Nuclear Blast imprint label Arising Empire. It’s the band’s first new album since 2004. On September 1st, they will release their new single ‘Crap Californian Punk Band’ featuring Lars Frederiksen from Rancid. Sept 30th– North East Calling, Sunderland. Oct 1st – Manchester. Venue TBC. Nov 4th – Midlands Calling – Wolverhampton, Wulfrun hall. 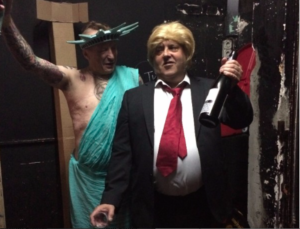 The post Peter and the Test Tube Babies singer refused entry to the USA for mocking Donald Tump appeared first on Louder Than War.